I have been busy decorating a bit more for the holidays. Decided it would be nice to have a white tree this year. Thought I would share the results with you. The tree is not a fancy one ($10 on sale at #DollarGeneral), but I think the ornaments dress it up quite a bit. I decided to go over the top this year and fill out the tree with decorations. I have been collecting glass ornaments for a long time. Now I no longer collect them, I just enjoy them each December. I also added ornaments to the tree which my mom had made. It is a great way to remember her each year. 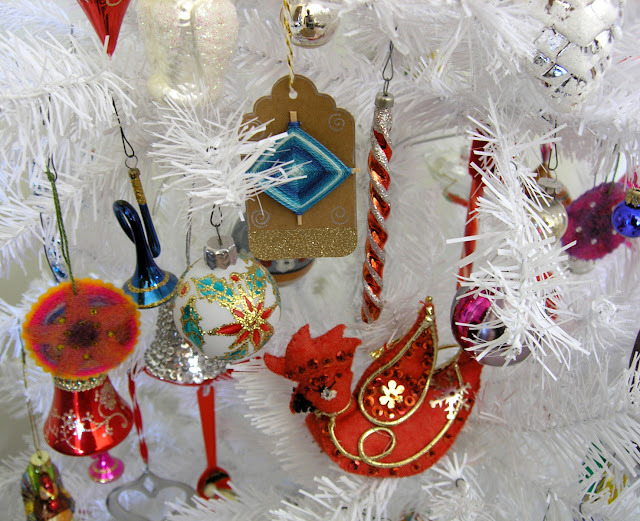 Also included are some of my handmade ornaments. A Pink Shiny Brite "A White Christmas" Ornament, one of two that I have, pink tatted flower I made, and a machine and hand needle-felted circle ornament I made in the background. 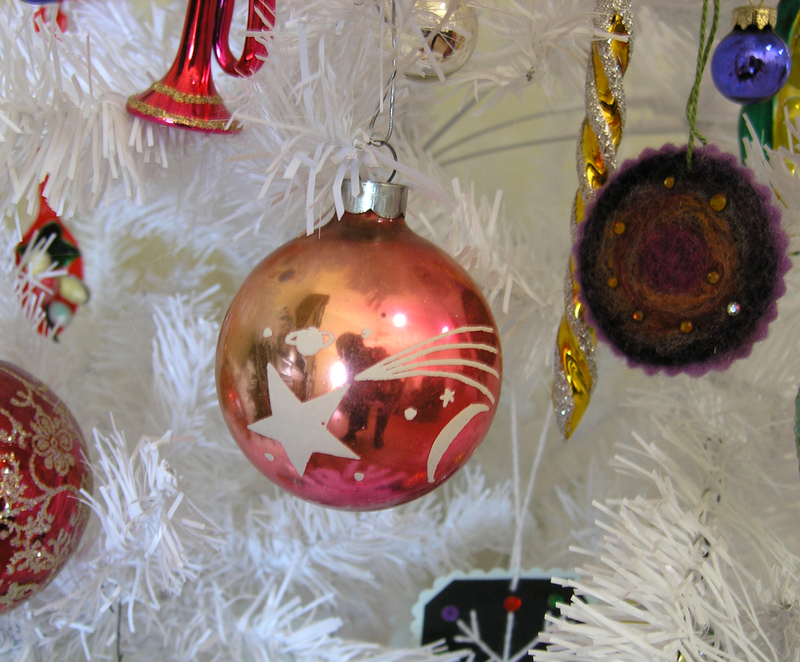 Second Shiny Brite "Shooting Star" Ornament in my collection, with another of my machine and hand needle-felted ornaments to the right. 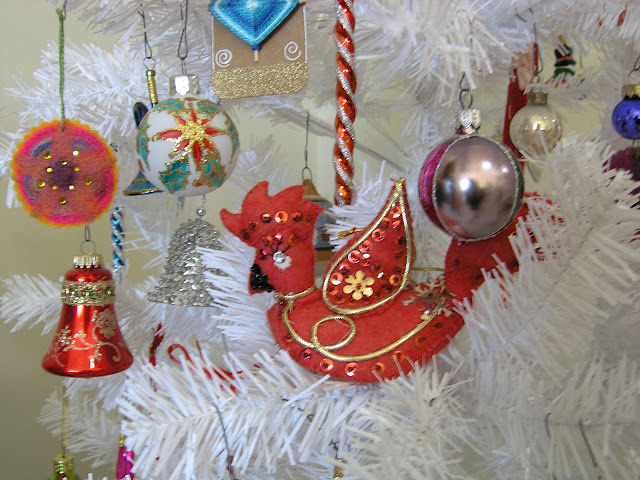 A treasure my mom made, a felt and sequined red bird ornament, with couched gold cord on it. I have always liked this bird! 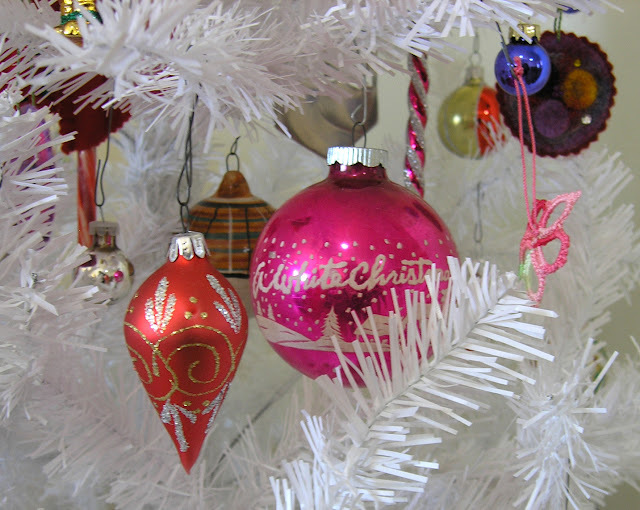 I believe I saw reprinted instructions on how to make this ornament in one of the Piecework Magazines from Interweave. There is also another one of my needle-felted ornaments to the left, with crystals applied. Some of my glass ornaments with one God's Eye Ornament I made to include in holiday cards one year, I kept two for myself. 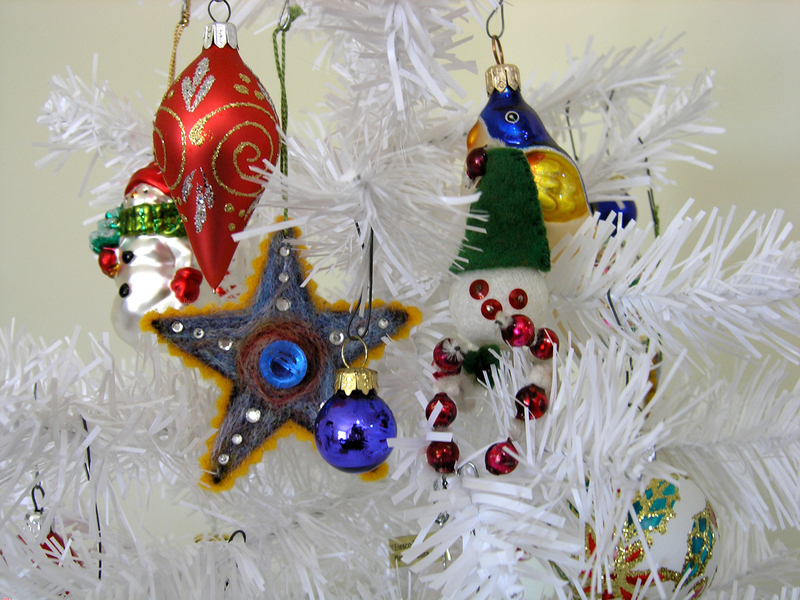 They are made from toothpicks, ready-made glittered gift tags, perle cotton embroidery thread and pens for decoration. 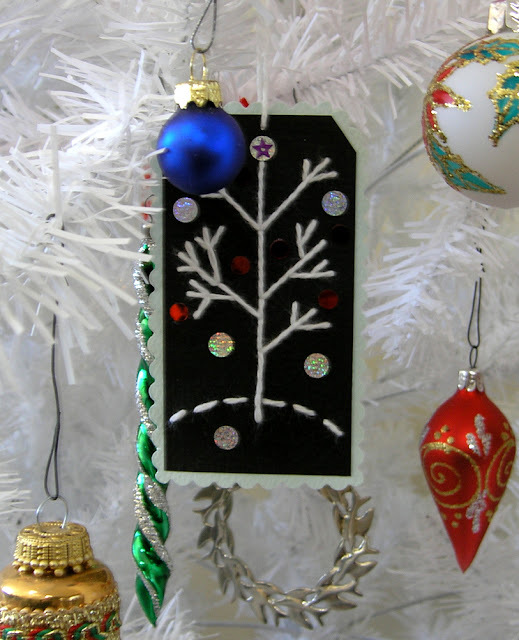 Holiday Gift Tag Ornament I designed and made one year to include in my cards. See the end of my post to see where you can download my free pattern instructions to make your own! One of my machine and hand needle-felted star ornaments next to a little elf my mom made. My mom would make ornaments for holiday bazaars each year with her woman's church group. (In the 1960 - 70s) She would often show me how to make ornaments and we would make them together. We made God's Eye Ornaments one year out of yarn and wooden dowels. Another view of Mom's bird, with one of my needle-felted ornaments on the left, and a God's Eye Ornament I made at the top. I like how the white of the tree shows off the ornaments. Another Ornament I designed, my Yo-Yos Cubed Ornaments and Pincushion Instructions can also be found for sale on the Craftsy site at: https://www.craftsy.com/sewing/patterns/yoyos-cubed-ornaments-and-pincushion/217496 Check it out too, if you like! 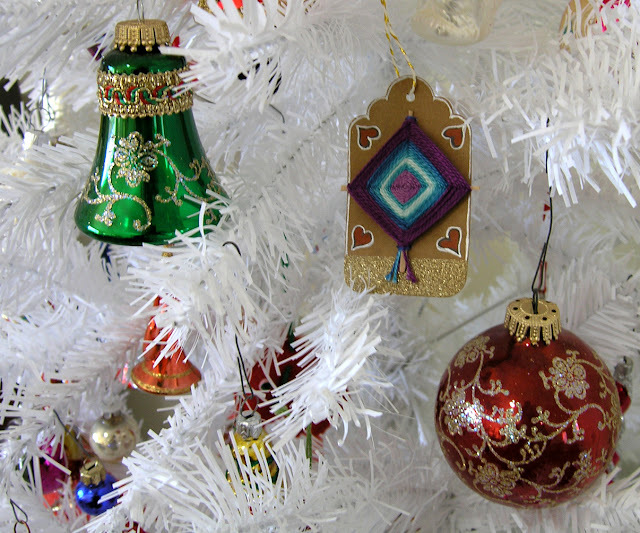 I was fortunate to have an article published in the Holiday 2013-2014 Quilting Arts Gifts Magazine on how to make the Machine and Hand Needle-felted Ornaments shown in the photos above. A digital copy of the magazine can be found here: https://www.quiltingcompany.com/store/quilting-arts-gifts-2013-2014. Hope you have enjoyed my Show and Tell! Some years I don't get much decorating done, but I do like looking in the magazines and online to see how others are decorating. O.K. to keep it simple some years and go all out on other years! Happy Decorating and a Happy Holiday Season to you!